'Near the Floora' Half Walls: fix of the UV map (invisible bottoms of the posts). simNopke-halfWallsFixes-all contains fixes of the Nightlife, Open for Business, Apartament Life and Mansion & Garden stuff half walls. If you have all of those packs, I strongly recommend using this file instead of separate packages. In this package, Perfectly Plank Half Wall and One Complete Diner Enclosure share mesh files. 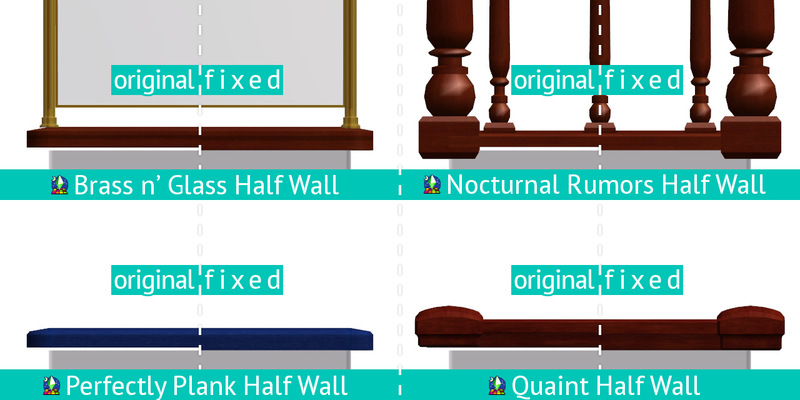 simNopke-halfWallsFixes-EP2 contains fixes of the Nightlife half walls: Brass n' Glass Half Wall, Nocturnal Rumors Half Wall, Perfectly Plank Half Wall, Quaint Half Wall and "The Wave" Half Wall. simNopke-halfWallsFixes-EP3 contains fixes of the Open for Business half wall: Half Centurion. simNopke-halfWallsFixes-EP8 contains fixes of the Apartament Life half walls: One Complete Diner Enclosure and Werknothom Half Wall. 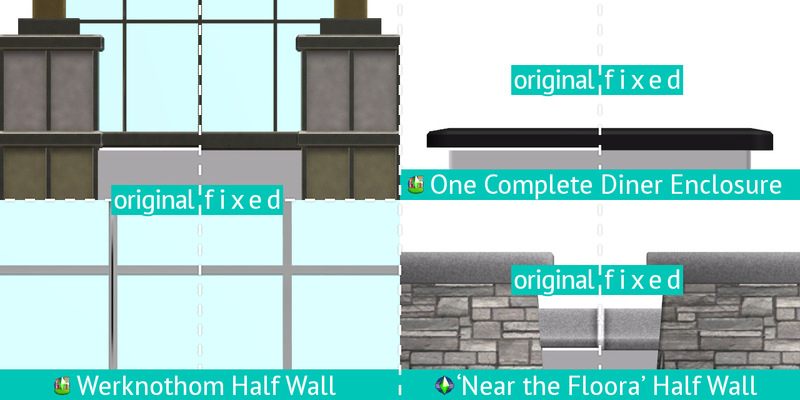 simNopke-halfWallsFixes-SP9 contains fixes of the Mansion & Garden stuff half walls. All of them are called 'Near the Floora' Half Wall. Do not use simNopke-halfWallsFixes-all with other packages. Other packages can be used together. The mod will conflict with half walls' default replacements. Originally, every half wall in the catalog has its own meshes, so there are lots of the same mesh files. I've decided to override only one mesh file of each half wall type, and change the references. 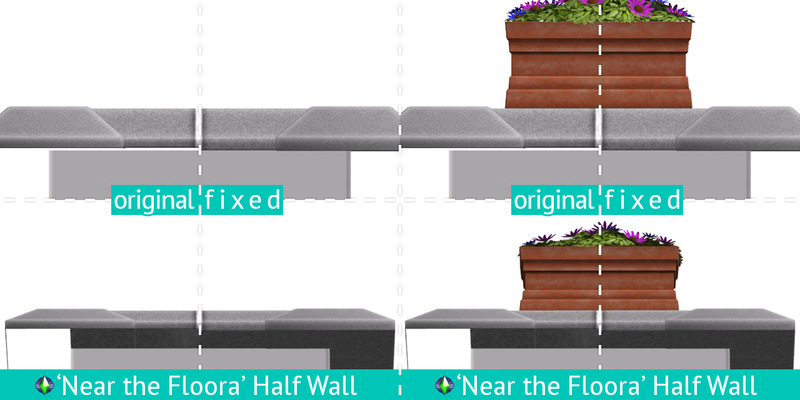 The half walls, which previously used the same looking meshes, share mesh files now. All packages override over 150 resources in total: the vast majority of the half walls' shape files as well as some half walls' geometric data container files.